Special care must be taken when deciding what sort of flooring to use in your fox's outdoor enclosure. They are natural diggers, so it is up to you to make sure that they do not dig out. Don't assume you'll be able to catch them at it or spot any holes before they get big enough to escape through. For a non-portable, permanent enclosure, I have heard of some people using a poured concrete floor. If you do choose to go this route, be sure to account for drainage or your enclosure will quickly become a swamp. Concrete can be very rough on a pet fox's paw pads, so plan to cover it in either dirt, mulch, or some other soft "diggable" substrate. Another common and highly effective floor strategy is to bury chainlink or similar fencing under a thick layer of mulch. This allows for great drainage, but also prevents dig-outs and escapes. There are many variations on this theme that can be explored--for Gizmo's outdoor enclosure, we have buried heavy paving stones under a thick layer of dirt and mulch to prevent dig-outs. This leads to a more natural look when he does happen to dig deep enough to uncover one. If stones are used, they need to be spaced very closely together to prevent the fox from digging between them. For the mulch covering, it's best to use natural, untreated mulch spread in a very thick layer over the entire area. 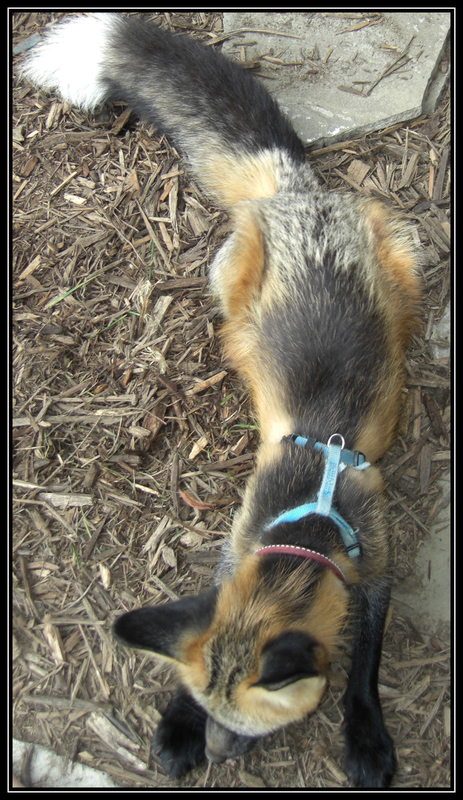 Treated mulch can have questionable dyes or pesticides meant to discourage termites in them--not something you want to expose your pet fox to. I also strongly advise against using any of the new "rubber mulches" that have come out. Yes, they're long lasting. Yes, they look great. But they're also made out of the same material as most dog toys. By now, your fox has likely come to view rubber as something to put in his mouth and play with, and a swallowed rubber mulch chip can lead to blockages or worse. Be sure to come back next week for more information on designing the ideal enclosure for your pet fox! That's the best information I have ever gotten about foxes! I am very interested in getting one and already have a floor plan for an enclosure. I agree that is the best info i have seen yet there really isn't much out there. I have 4 fox's i got from a ranch and love them but want to get them in bigger enclosures but don't want to risk escape.I live in a farm town so i have a few acres but if they get out i am in trouble and they will get shot. They are so cute and i love them. Is it possible to just attach your fox to a very long rope and then a leash and then have it run around my yard? You could train it not to dig, there breeds of dogs that dig holes. When burying fencing or stone in order to prevent a dig out, how far from the wall into the enclosure do you recommend going? Or, are you suggesting covering the whole floor...?